There has been a garden in the Furnas Valley for over 200 years. Seen from the top of the Pico do Ferro viewpoint, you can see that the “valley” is actually a crater, seven km in diameter, and the last remains of an apparently long-extinct volcano. 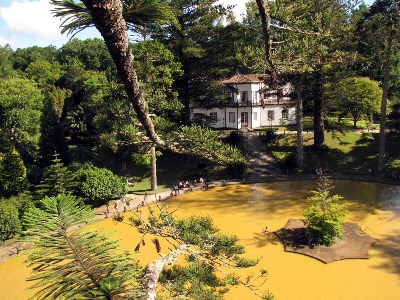 The Furnas Valley became popular towards the end of the 18th century, due to the growing interest in the use of mineral water to treat health problems, such as rheumatism and obesity. Furnas has hundreds of small springs and streams, all with different properties. The Terra Nostra Garden is born in the midst of this magnificent water system. Today at Terra Nostra, you can find flora typical of the Azores and impressive century-old trees, some of which were shipped from as far as North America, Australia, New Zealand, China and South Africa. Over the past two decades, Terra Nostra has continued to enrich its botanical value through the acquisition of new plant species. This constant concern to diversify and enrich the existing flora ensures that the garden now possesses large collections with plants of major historical and cultural value. These collections include the Camellia Collection, the Fern Collection, the Cycadales Collection, and more recently the Bromeliad Collection. All of the existing flora, in a garden area of 12.5 ha, contribute with their colors, forms and growth to making the garden a fine destination in itself, and wonderful to visit any time of the year. 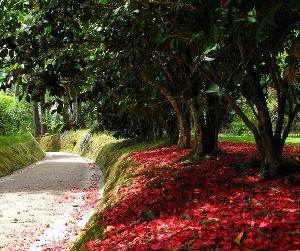 Due to the existing acid soil, camellias adapted well and can be found over the entire Azorean archipelago; however, it is on the island of São Miguel that the greatest concentration of cultivars and broadest genetic diversity can be found. 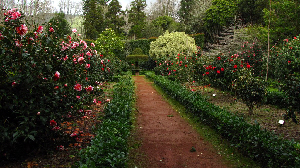 On São Miguel, Camellias are very common in both public and private gardens, often being used as hedges to provide protection against strong winds or to set boundaries. The Terra Nostra Garden, possesses an extensive collection of camellia shrubs, including both ancient and more recent cultivars. The more than 600 different species and cultivars of camellias found in the garden enrich the natural landscape and create an environment of unique beauty, from autumn (with the flowering of the Sasanqua camellia) until spring, with the flowering of the other species. Many of the camellias in the Terra Nostra Garden have been identified and labeled and have been divided into distinct areas, set out according to the surrounding landscape and devised in such a way as to facilitate exhibition of the entire collection. As such, visitors will find the camellia garden divided into five distinct areas, filled with cultivars of Camellia japonica, Camellia reticulata and its hybrids, Camellia sasanqua and its hybrids, hybrids, and botanical species. However older trees of Camellia japonica can also be seen along the banks of the lake as well as along the garden paths. Head gardener, Fernando Costa aims to continue increasing the number of Camellia cultivars in the collection by bringing in new examples, as well as hybridizing existing plants.